Welcome to Dave Pietromonaco's Home Page. So, who is this Dave guy and what does his cat look like? Have you ever wondered how fast the current crop of microprocessors are? Find out the startling revelations on my new World's Fastest Microprocessors page! Ever wonder where that e-mail address really goes? Where the mail gets forwarded or what the real name of the machine is? Want to know if somebody gave you a bogus e-mail address or a real one? This is the page for you! Have you ever wanted to see a big display of the Earth on the background of your workstation? How about with all the world's largest earthquakes, tropical storms and some temperatures on it updated in real time? Did you ever want to find some of the nerdiest places in Silicon Valley? Maybe you're wondering where Apple Computer is, or where the old famous Garage where Hewlett Packard started is located? Wonder no more! Check out the Nerd Tour of Silicon Valley!!! This contains GPS locations of nerd sites fed into links for two major www map viewers so you can see exactly where these places are, as well as street addresses, photos and web links to site homepages. Here's Dave's review of his trip to Florida! With Photos! 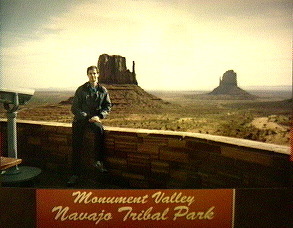 Here's Dave's review of his Rocks & Erosion Tour '94 plus a photograph of Monument Valley. Dave's writeup on his trip to Japan! With Photos! Here's what Dave remembers of the California Driver's License Exam! New and better than ever! Dave's Rocks & Erosion Tour '97 with inline photos and video clips! Destinations include Carlsbad Caverns, Mesa Verde, Arches National Park and Bryce Canyon. About half of Dave's trip to Ecuador! More videos, more pictures! All photos and video are direct digital transfers from digital video! I now have started my very own art page, consisting (surprisingly) of my very own art. Check out Dave's Art Page! You may also listen to Homer Simpson saying a couple of his favorite phrases, wahoo, or laughing. What you can't play sounds? A computer that doesn't play sounds is really boring! Rather than try to describe everyone or list everyone with the same 'good person' summary, I have just mentioned how I met them, and you can find out about them from their home pages for yourself. My roommate when I was at Stanford, Henry Chao. I met him in my Semiconductor Physics classes at Stanford, Michael Kwong. I met him on my trip to Sony in Japan, Takahide Kadoyama. My big brother, Paul Pietromonaco. I met him in my bipolar analog circuits class at Stanford, Ralf Schwarz. I met Dino Tsai through his sister, Suefen. I went to Seattle U. with Jason Wetzel and we were in the Physics Club, together. This is NOT a particularly exciting video. 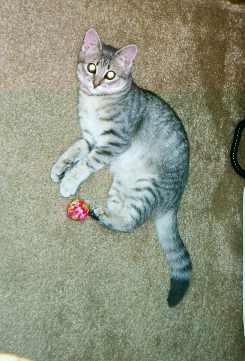 It lasts only a few seconds, has me getting her attention and her going, "meow." But, here it is anyway, the Minnie-Mini-Movie which is 260k in size and has sound and video. I was down by Shoreline Park playing with my new videocamera and I spotted a Blackbird Pecking at a Fluffy Squirrel. Darndest thing I've ever seen. I worked on the CXA2075. Here's all the information I can find about it. Pictures of a big, icky spider a friend found in their apartment. Anybody know what this is? How about another photo or yet another photo. The spider's body was about an inch long. Quality is definitely going up! I can now make full digital transfers from my Sony DCR-VX1000 DV camcorder through my MotoDV Firewire system onto the computer; a Powermac 8500, upgraded to a 225MHz PowerPC 604e and 176MB of RAM. Conventional photos are now scanned with my Hewlett Packard Scanjet 3c. Many older pages were created using my obsolete Mac IIsi (This is because my obsolete Lisa computer or Apple IIgs couldn't do the job), which I had accelerated up to 25MHz, so it's more like a IIci. The graphics were scanned from the camera of a Sony CCDV-220 and frame Video camcorder. Some of the photos were taken with this but still sampled through the videospigot since I didn't have an IEEE 1394 digital interface when I scanned them. Some images scanned from video I've done on my new Powermac 8500, using the built in video hardware. The map location for where I live (on the personal page) was determined with my Sony PYXIS GPS receiver. Connection to this page is brought to you by a dedicated ADSL, operating at 128kbps in your direction (1.2Mbps in mine :). Sitting on my end of the ADSL in my living room is a Hewlett-Packard Pavilion 8240 running Apache HTTPD server on RedHad Linux.